This classroom demonstration illustrates the amount of water stored in various parts of the Earth system in a straightforward manner. Students estimate the proportions of water in the oceans, icecaps and glaciers, groundwater, freshwater lakes, inland seas, soil moisture, atmosphere, and rivers. Then they fill beakers with the actual proportion and discuss what elements of the activity were surprising to them. Information on flash floods and flood preparedness and safety are included. This learning activity takes approximately 20 min. This teacher-based demonstration could be flipped around into a student-driven investigation. The 'fast facts' in the sidebar are quantitative and thought-provoking. Did you know the 48 contiguous United States receives a total volume of about four cubic miles (6.4 cubic km) of precipitation each day? The activity begins with predicting and understanding the proportion of water in different places. This makes an abstract concept into a quantitative one. Then, a class discussion focuses on how little water is found in rivers and the atmosphere and how we can keep our drinking water safe. The activity concludes with a discussion of flood safety. This activity is not directly related to climate change, but is part of overall climate literacy in terms of understanding earth systems, freshwater resources, the cryosphere, and flood hazards. Note: I did not find a link to the data both listed in the fast facts section and the percentages table. Not sure which year this data was gathered from. 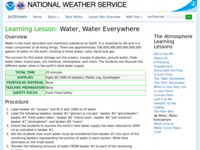 This simple activity provides a hands-on explanation of the water reservoirs within the water cycle to supplement the typical graph or chart on freshwater sources on Earth. Activity could be used as an engagement 'hook' as a lead-in to any water-related topic. For higher grade levels, students can do the unit conversion on their own and calculate how many milliliters of water to put in each beaker. For a lab setting, groups of students can have their own beakers to fill up. Visual learners might appreciate a pie chart or other graphic as a way of representing the scale of water in different reservoirs. This is a very simple and intuitive activity. If there is no access to water or beakers, the activity could be replicated by coloring in beakers on the white board.